As an interior designer I’ve been fortunate to have the innate ability to create living experiences that are more enduring whether its a living room like this one or a work space like the shower in the next photo. 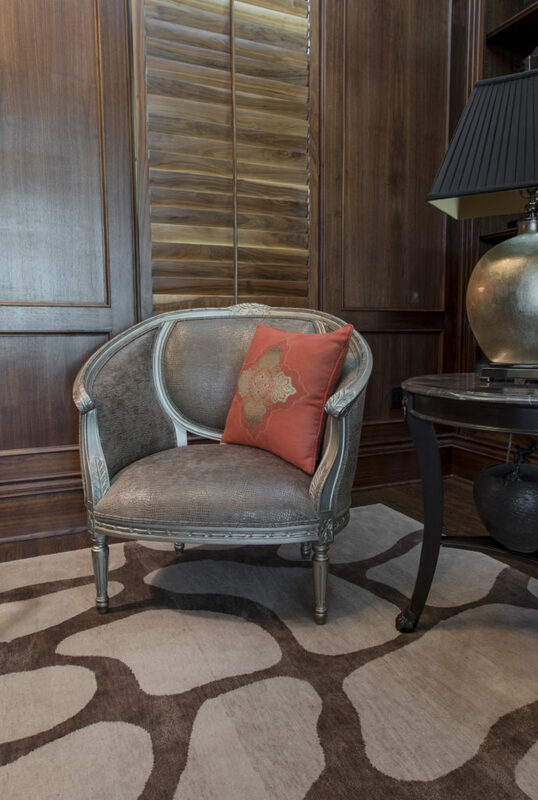 In this living space quality upholstery, less patterns, and simple lines create a lasting appeal. Even though finishes on furniture are important the most critical element to making an interior more timeless begins with finishes that are classic and enduring like this marble type tile we used on this bathroom high rise to make it last for years to come. 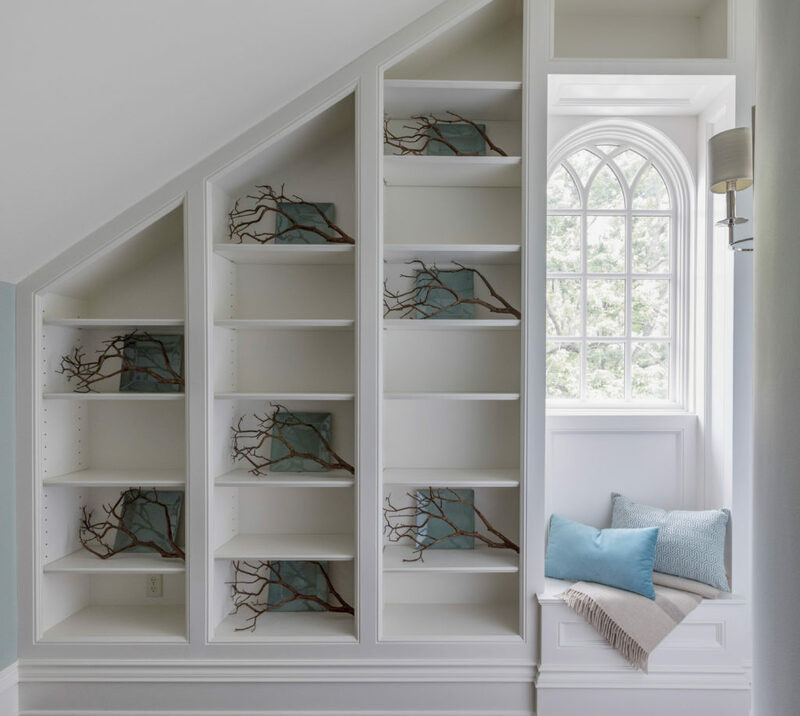 To read all 8 of our secrets to creating spaces with staying power that we wrote for HOUZZ, including specific examples of each, click on the link below. 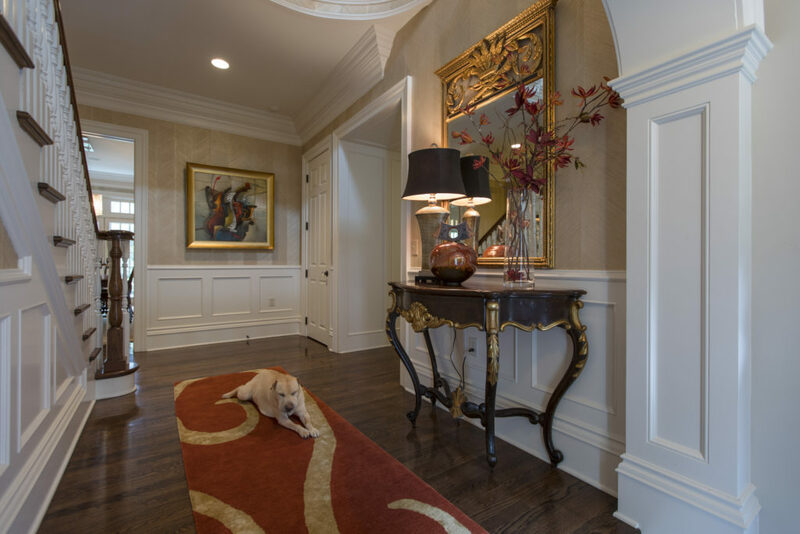 Unwelcoming – If you want your guests to feel welcome then its important to create an inviting foyer like this one we designed where you are greeted by rich colors, great lighting, a comfortable rug underneath, and warm textural wall coverings that wrap you in a big hug. Of course Lucy (the dog) will be sure to say hello if she’s around too! 2. 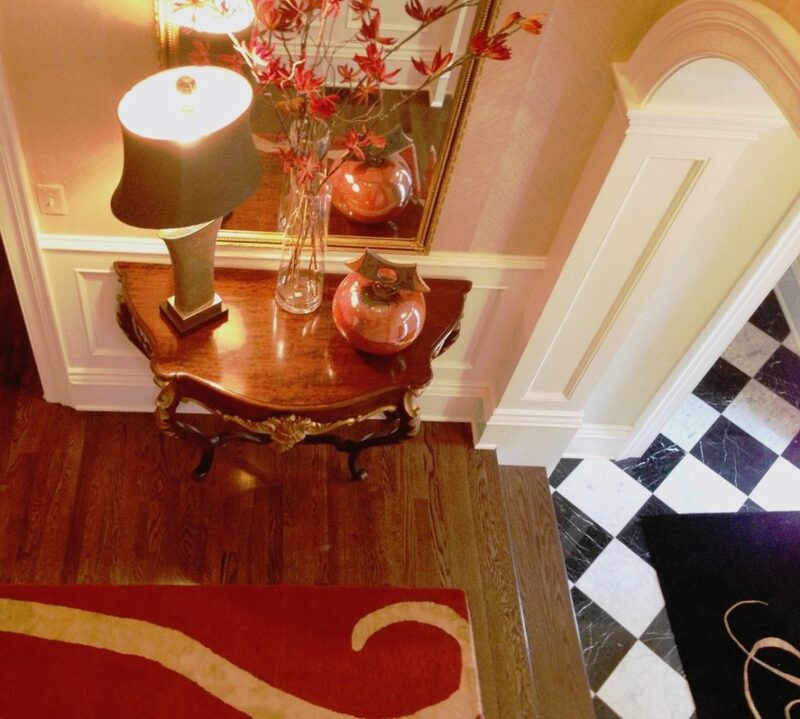 Zero Personality – As an interior designer I can’t repeat enough the importance of showcasing your personal style in the foyer. I believe the entry to be the most important area in your home because it gives people a hint of who you are and what you like. 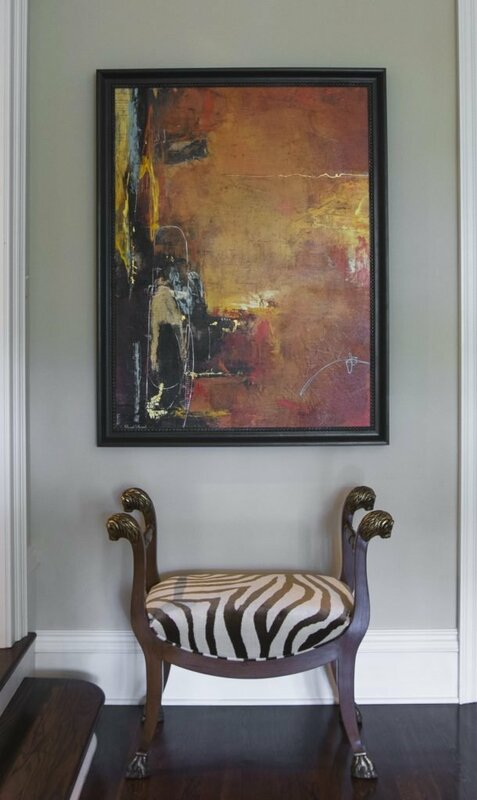 In this entry area we showcased the clients’ love of animal prints on this traditional custom designed stool while also showcasing their sophisticated taste in mixing styles with the abstract art above. 3. 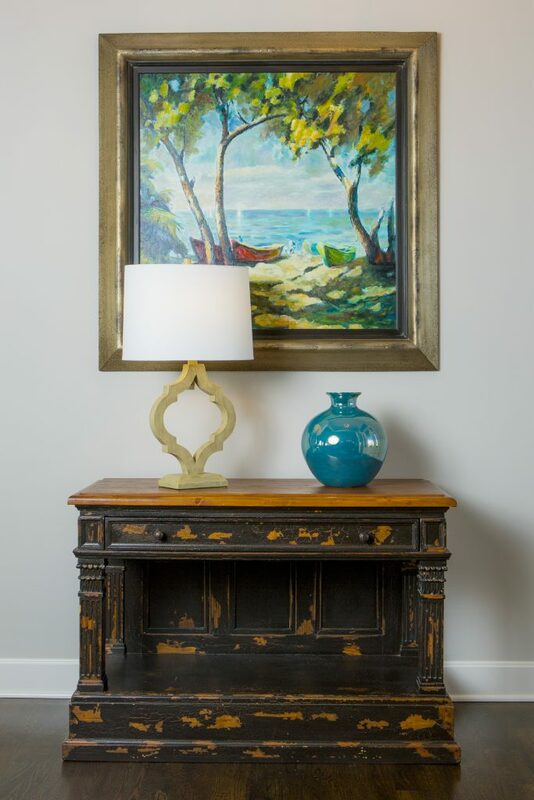 Lack of Intrigue I always tell our interior design clients to think of their entry as the advertisement for their home because your entry should give visitors a glimpse into what’s coming next from colors and style to personal mementos like this entry where we began with a family heirloom piece (one of many) and dressed it up with a beautiful landscape painting, vase, and lamp that give you a preview of the color scheme and what’s next. 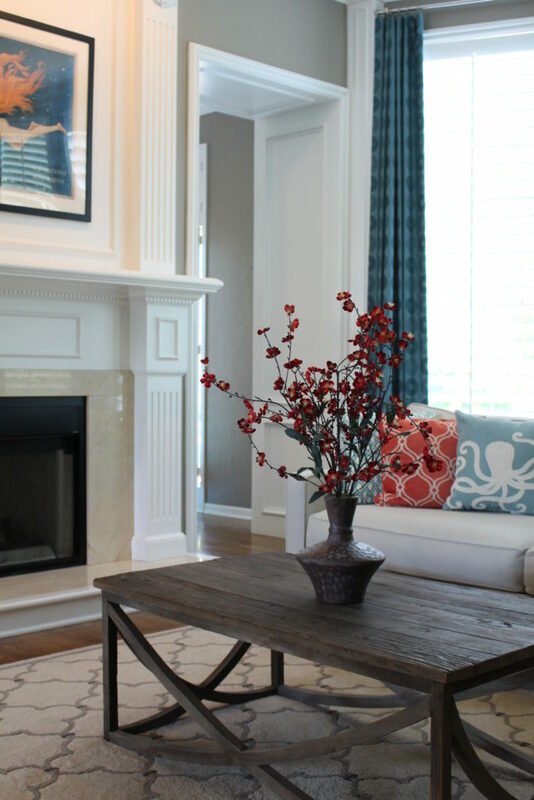 Lack of a Focal Point Often the best spot to emphasize in a living space is the fireplace or great view outside but if you don’t have those options, create a vignette (grouping) of furniture/accessories that will grab your attention. 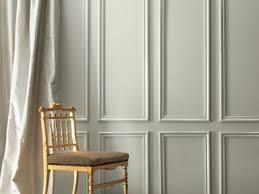 Then group your upholstery around the focal point to emphasize it. Here in this living room a focal point was created on the back wall to entice people into the space for a closer look. 2. Purchasing Over Sized Upholstery Or Too Many Pieces Have you ever decided you wanted to buy a new living room grouping but didn’t bother creating a floor plan or measuring the space first? Suddenly your furniture arrives and the furniture takes up so much real estate you can barely walk through or don’t have room? As an interior designer I can’t tell you how many frantic calls I’ve received from homeowners requesting help with their space planning only to discover the wrong furniture was already purchased and they want me to fix it which we know is impossible. 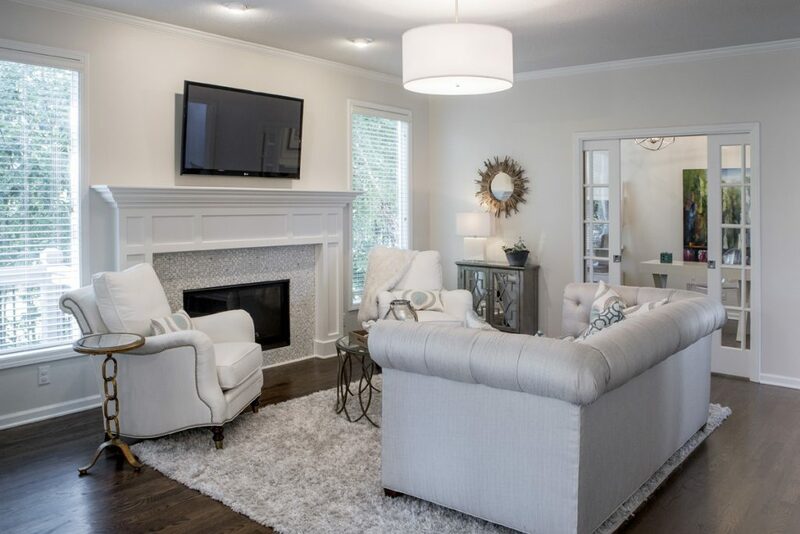 In this living room, the right size furniture was used and strategically placed to not only enhance the focal point (fireplace) but also leave ample room for someone to pass through. 3. 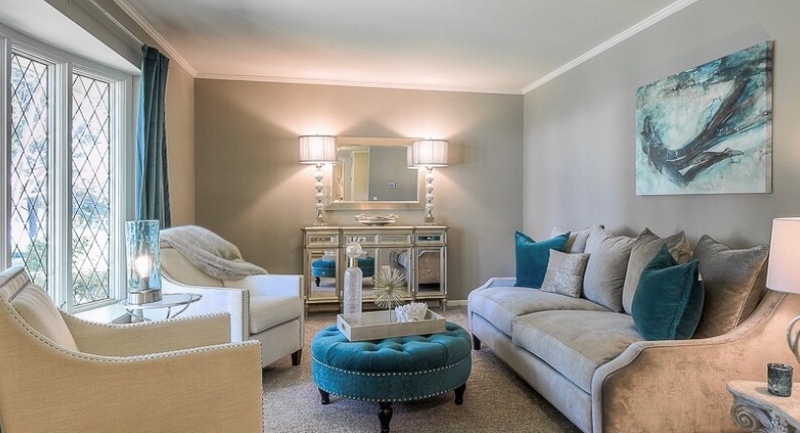 Selecting The Wrong Wall Color After working on 1200+ interior design projects I see this mistake happen more than any other. We might want to blame a decorating network like HGTV or DIY for making us believe that picking paint colors is easy but I think its because the general public doesn’t realize how much a color can change when it goes from a tiny paint swatch to an entire room or house. In this room, we selected the paint color during day that not only coordinated with the finishes and furniture but also played well with other rooms in view. OPEN CONCEPT – In 2008 I talked about open concept living where master suites will merge sleeping and bath areas together on my broadcast interior design show Living Large. Now I’m finally starting to see this open concept appearing more in upscale hotels which means its coming to homes next! 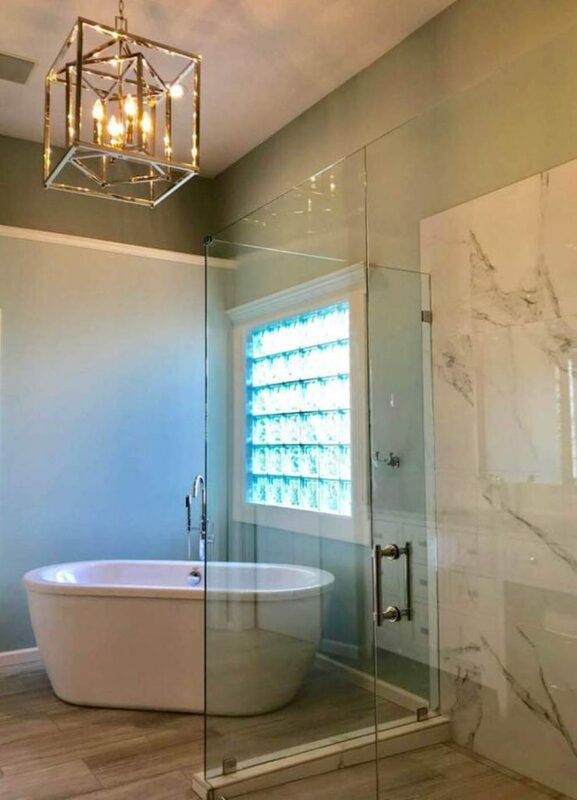 The precursor to that open concept are bathrooms with glass or an open shower where you can see the plumbing with zero entry (no curb) tile that extends into the shower which will gain popularity this year like this bathroom above. 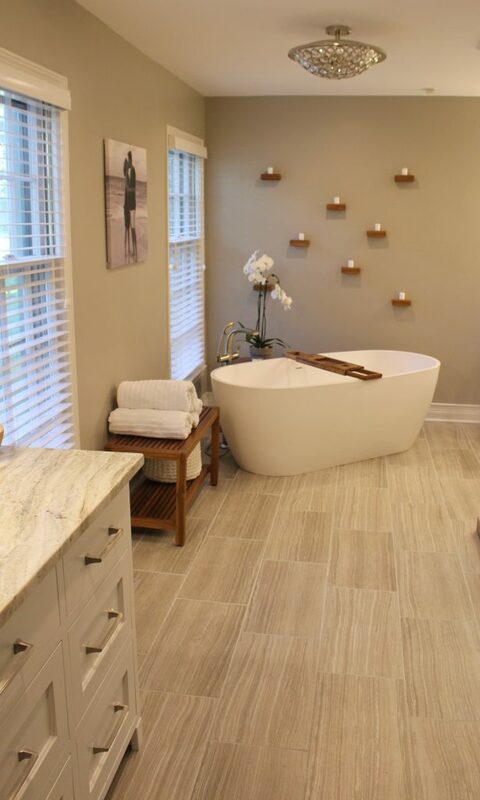 A free standing tub and light airy chandelier add to the look. 2. SPA LOOK WITH A WOW FACTOR Not sure the spa look will ever die because its so appealing but bolder colors will increase for this year including a trend towards dark colors like dark gray or black paired with light neutrals, especially white. In this bathroom we added a candle wall over the tub to create a wow factor when you enter the space. The rolled towels and teak furniture in wood to coordinate with the shelves reinforce the teak feel. 3. MORE TIMELESS APPEAL – Marbled tiles, sleek lines, less busy patterns and a neutral palette help create the more enduring look. In this nationally published project we designed an unique vanity that feels classic in front of marbled tile that runs up to the ceiling for a wow factor. And in the adjoining shower we designed a jewel box of a shower that becomes part of the room, making it more timeless and definitely a showstopper. 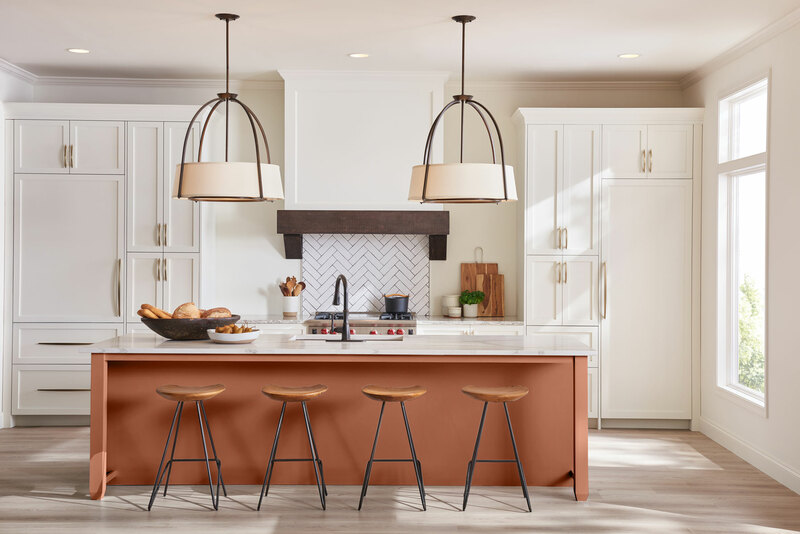 If you’re like most of us whether an interior designer like myself or a homeowner, you’ve probably either recently remodeled your kitchen or are seriously thinking about it. 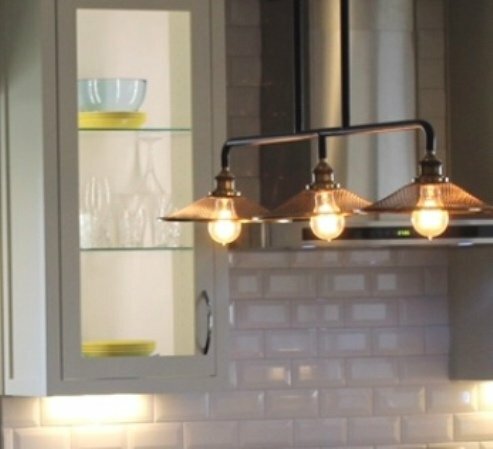 If so here are 3 kitchen trends you might want to consider. Personalization can come in not only in a fabulous color scheme like this beautiful hint of green mixed with white and bronze selected by one of our favorite clients, but it may also be part of the design aesthetic whether its in materials, finishes, or the overall theme. In this space one of our clients was from Finland so we incorporated a bit of a rustic element to remind them of their lake cabin there while also showcasing their love of contemporary in the stove hood. 2. 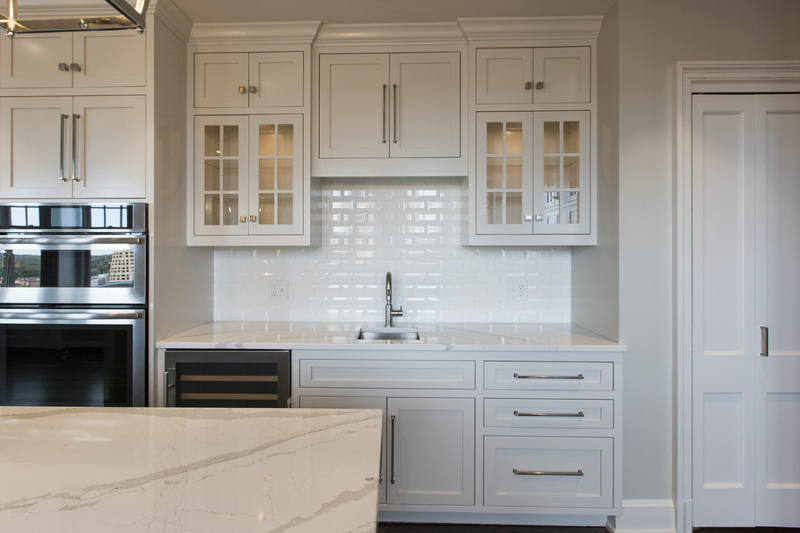 Bolder RIch Painted Cabinets For years we’ve nurtured our love for all things white and I’m not sure that trend in kitchens will ever die because white cottage kitchens give off such an inviting vibe, but the kitchen trend for 2019 is heading towards a bolder painted hue along with color schemes overall. But if white kitchens are you’re love they can still work if you add bold pops of color. In this kitchen refresh with a fun client we absolute love, we painted the existing wall cabinets darker shades to create a bold contrast after installing a counter top that continues up the wall as the back splash too. 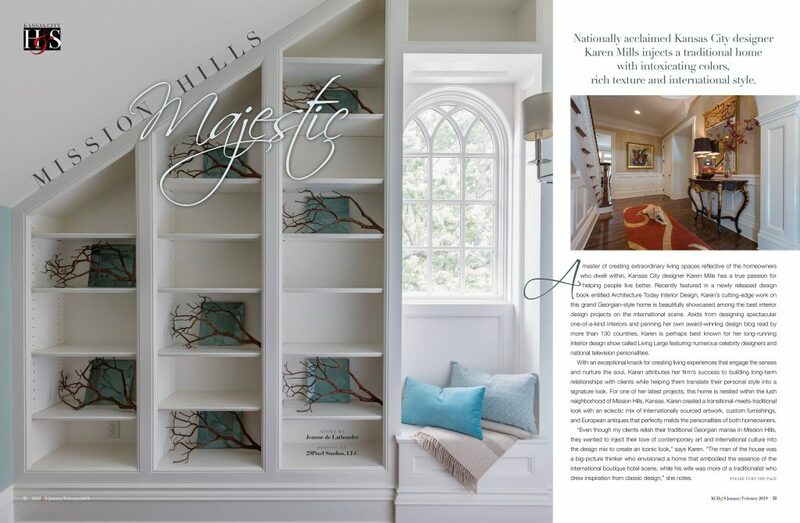 Live edge shelves, pottery, and whimsical chandeliers add to the personal touch. 3. 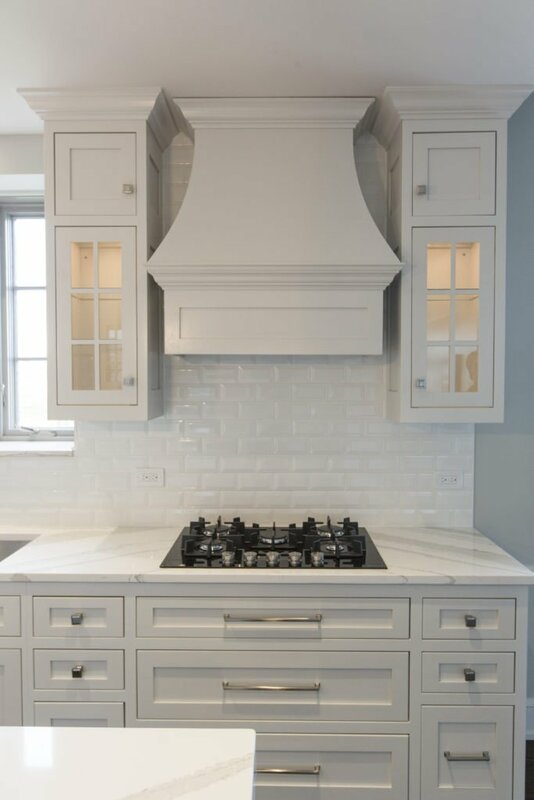 Take Your Back splash to the Ceiling Tiles for the back splash are starting to make a big statement in kitchen remodels for 2019 so we are continuing to see a rise in taking the tile to the ceiling everywhere. Bold patterns are also becoming more popular as the back splash takes center stage. In the kitchen here we ran tiles to the ceiling to accentuate the beautiful hood, the main focal point of the room. Often we take sleep for granted until we start to have problems with concentration, alertness, or our overall ability to function well. Then good sleep becomes more of a priority. 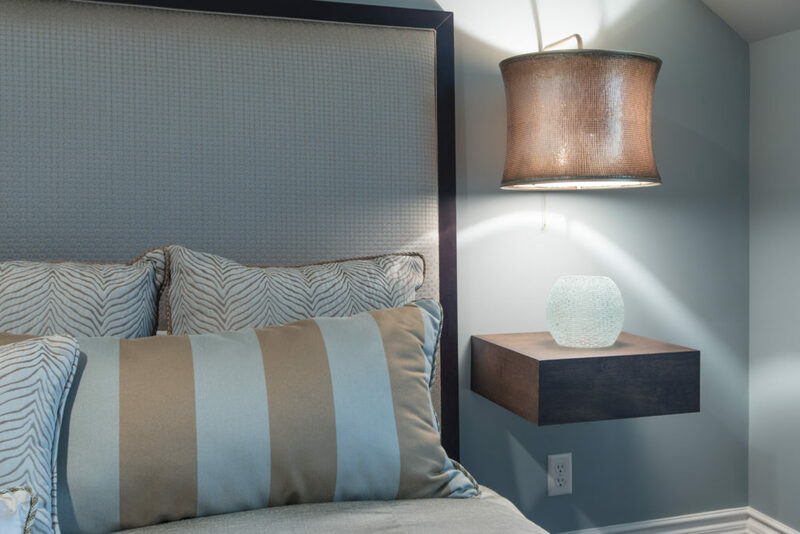 Read on for 3 ways to create a nest like atmosphere in your bedroom that’s conducive to better sleep. Simpler Bedding and Patterns As an interior designer I’ve used simple tone on tone patterns and texture in bedrooms for years but this trend for bedding is going public for 2019 in everything from fabulous washable lines from Italy to textured velvet or sheared fabrics like we’ve seen recently in fashion wear. Here in this bedroom Italian bedding in simpler patterns, textural finishes and clutter free space create a stress free environment where we can unwind and relax. 2. 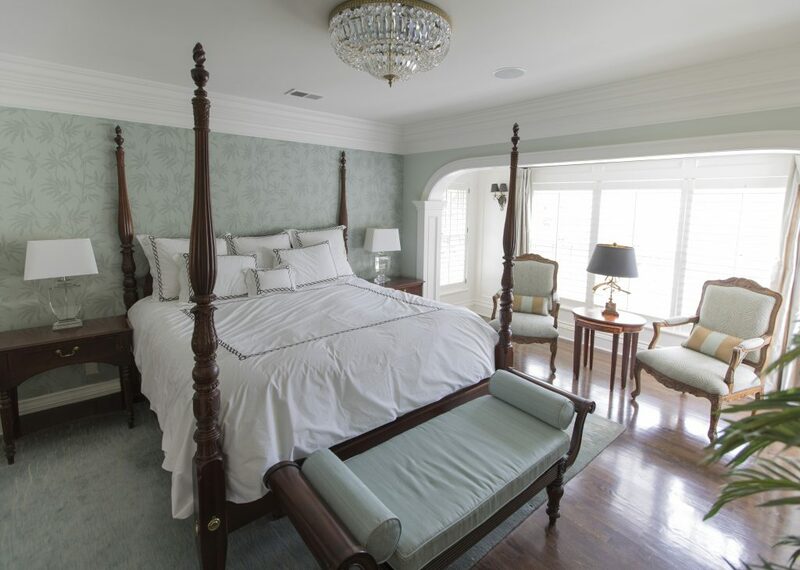 Cozy Beds Beds that envelope us will continue to be popular whether its are a four poster bed, an upholstered bed like this guest room, or a fabulous combination of both. 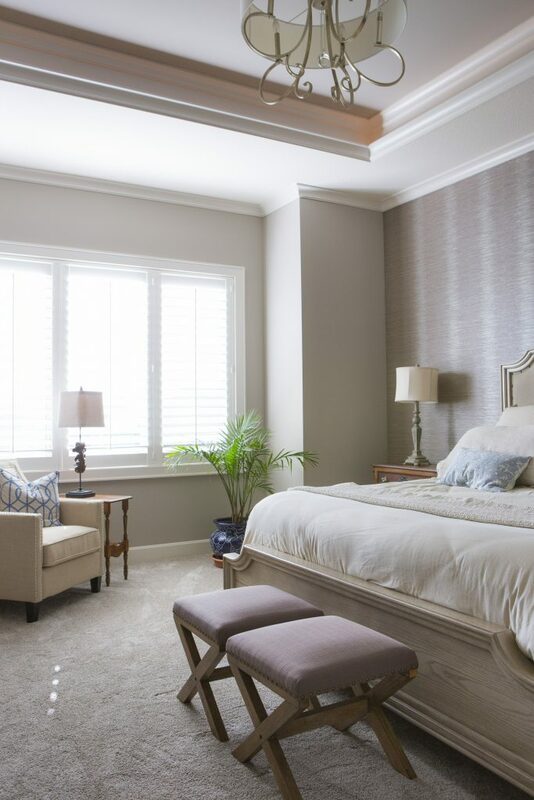 In this guest room calming colors and patterns, low lighting, and clean lined furnishings enhance the overall feel. while the wallpaper, area rug, upholstered bench, and simpler fabrics on the chairs beyond enhance the relaxed inviting feel of this space. 3. Textured Walls Painted accent walls have been a craze for years but wrapping the whole room in textural walls will gain popularity in 2019. 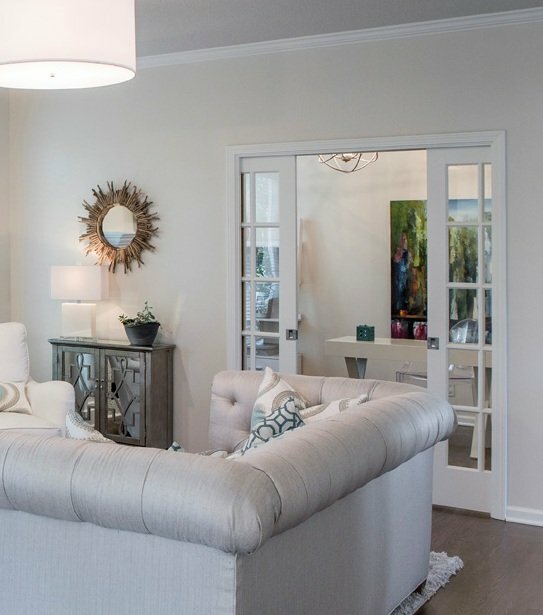 In this space featured by Curated Kravet an upholstered bed, area rug, bench, throw, and bedding add to the cocoon feel created by the gorgeous textural walls enveloping the space. 1. 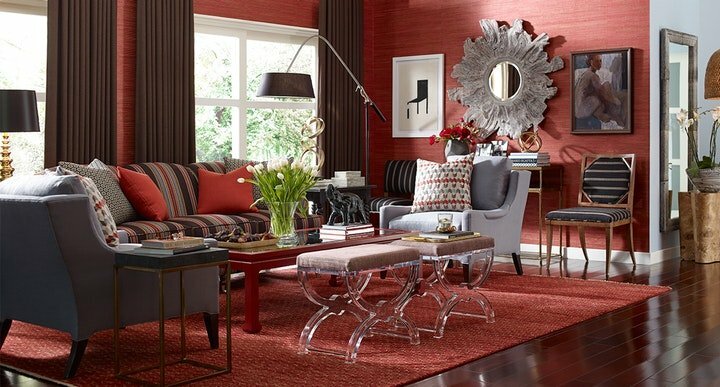 Warm Vibrant (or Bold) Colors For the past ten years we’ve seen gray neutral colors dominate the interior design scene but now as an interior designer I’m noticing a return to bolder colors with warmth whether they’re in a whole room color scheme like shown here or just as an accent in a light neutral warm hue. In fashion this fall crimson red, warm yellow, and tobacco brown mixed in new and unusual ways made a strong comeback including bold combinations like red, black, and white which I will cover in more detail in an upcoming blog. 2. Nesting Trend Homeowners are beginning to return to nesting with all the turmoil in the headlines so we will see a resurgence of comfortable and inviting interiors that are textural including finishes like rattan or raw wood, artisan products, and curves on our sofas or sculptural items. In this entry the space is warmed up with branches and a comfortable fringe throw along with with comfortable pillows. 3. Health and Wellness With environmental factors impacting our health right and left along with an over abundance of processed foods, people are looking for healthy alternatives whether its natural fabrics and controlled sleep environments like our Sleep Better Live Better program or the ability to cook farm fresh meals in the kitchen. 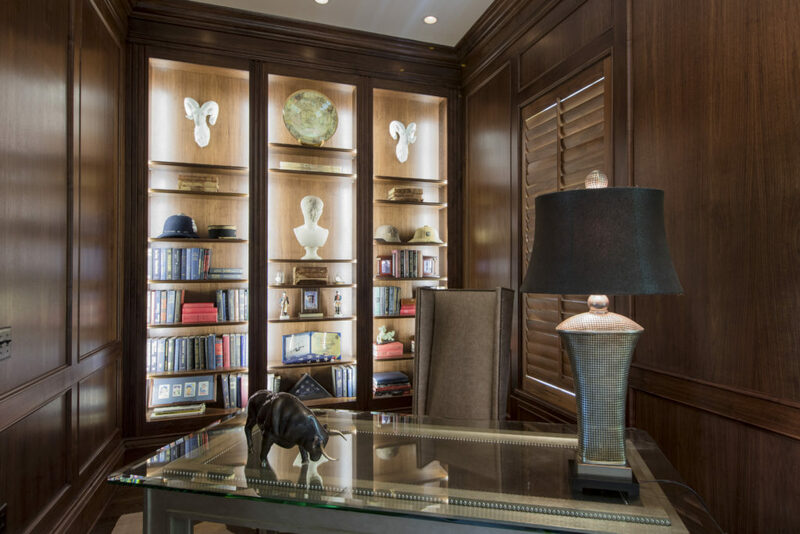 Here in this room shades made of natural fibers, an antler lamp, and wood art piece bring a sense of well being to this space. 4. Personalization Even though we’ve heard this term before its still a huge trend this coming year as evidenced in this library we designed that’s has been completely personalized for our client from the custom desk made of champagne wood, leather, and glass and accompanying pebbled leather chair to the custom designed rug underneath, snakeskin chair , and mementos from world travels displayed on the shelves beyond. 5. Maximalism For years we’ve seen a minimalist trend with less pattern and movement but that’s changing and we will see more bold patterns and/or colors mixed together in a mix of design styles like this entry that includes an antique french console table, classic black and white tile, hand made wallpaper, and a custom contemporary rug in this contained space. So what’s not hot for this coming year? First copper or rose gold is starting to lose ground in finishes along with single accent walls and overly ornate details. Cool grays, all stark white, wall signs, and ikat patterns have also fallen off the trend wagon for next year but that doesn’t mean that warm grays or white can’t be combined with other vibrant colors which I will cover in an upcoming blog. 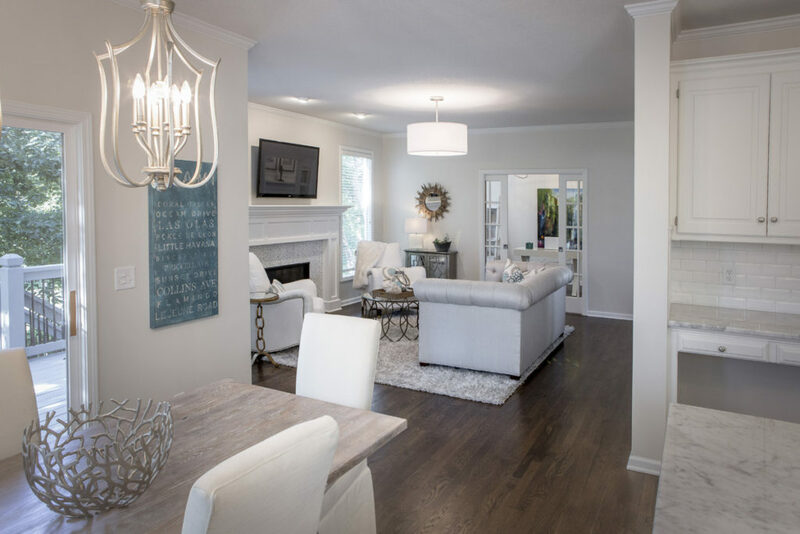 The architecture or bones of the house are the most important elements when building or remodeling because they set the backdrop for any interior design you’re about to create and determine the style of your space. That’s why not only the walls and ceilings are so important but also the doors and windows. Here are 3 ways you can use doors to create drama in your space. 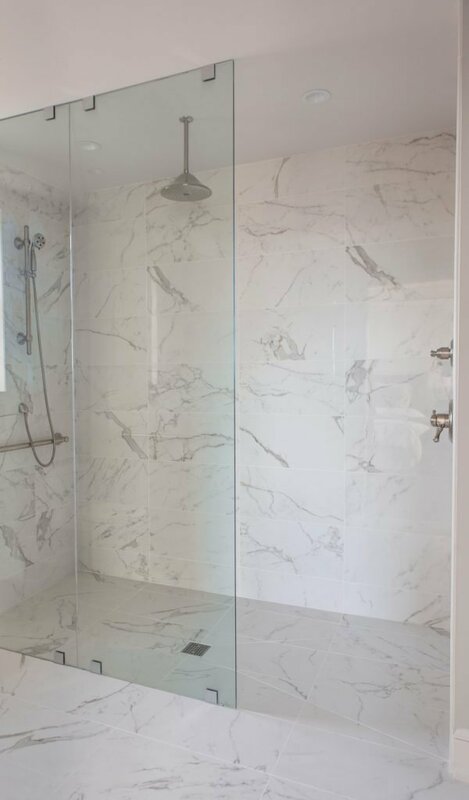 Make your door the focal point like the shower door pictured here. In this room the grid design of the door draws attention to itself along with the dark dramatic color, making it the star of the room. Once you’ve selected your shower door, then you can repeat the color or pattern on the door to unify your space. 2. Introduce doors that are wider or taller than average to give a grander feel to your space. In this room the french doors appear to be taller by adding a transom above. Recently completed an interior design project for a client where we specified 8 foot doors to create a majestic look walking in the front door and we are currently creating a fabulous new interior design project where every interior door will be at least 8 feet, completely transforming the space into a grandiose one of a kind home. 3. Use doors to divide space without visually closing off the rooms in an open floor plan. The french doors here create a wonderful view into the adjacent home office while providing an option to be closed when needed. Logged in as Karen Mills. Log out? 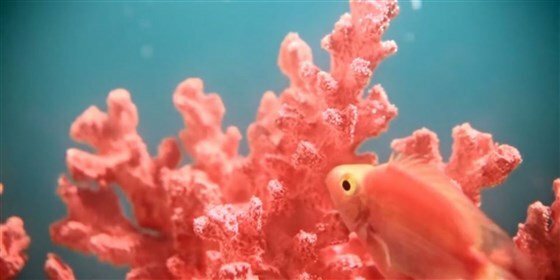 The impact of the annual color forecast by the Pantone Color Institute reaches much further than what you might imagine covering a wide range of industries from interior design and fashion to cars and appliances to name just a few. Why? Because their forecast is considered to be the one to follow for what’s new and next. But today I want to include a couple of other color forecasts for 2019 along with sharing color trends I see as an interior designer for the future. 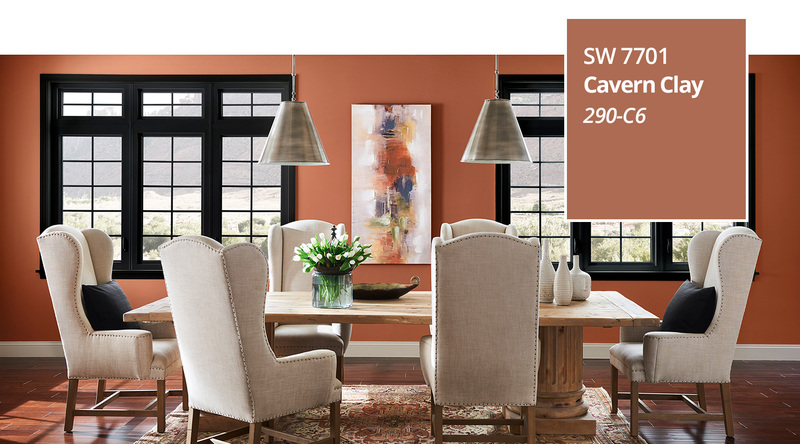 As you read through this color forecast look for similarities because I think you might notice an overall trend this year for color. Even though I’m still a big fan of warm grays, I have to admit I’m a little bit excited to see warm vibrant colors and bold color combinations coming back into vogue. Red has been huge trend this year in fashion, especially with black, white or other vibrant colors like golden yellow, bold blue, and persimmon. Golden yellow or mustard will be popular also along with a return to more traditional tobacco colored in leather, suede, and other materials like this wall pictured above.